On November 8, 2016, the date of a remarkably historic U.S. election, the People of the State of California voted Yes on Proposition 64 in favor of Marijuana Legalization. This makes California the final Left Coast state to legalize it! Previous California law restricted access to the plant to medicinal purposes only, but with the passage of Proposition 64, the law states that recreational cannabis consumption is legal for persons age 21 and over. This Proposition has no impact upon Federal law. Prior to the 2016 election, many in the cannabis community were divided on the topic of California Proposition 64, with a surprising number of opponents. 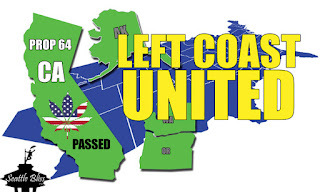 Why would some Californians, particularly those involved in the green industry, oppose this Proposition, and in contrast, what are the presumed benefits for the State of California, as well as, for that matter, the entire Left Coast? The anti-Proposition 64 individuals in the California cannabis community, including those in the medical field, have concern that such a law will create excessive rules and state regulations. Farmers say they don’t want “the Man” meddling around in their business. Many feel the system as a medicinal force was working just fine. Dispensaries worry about loss of business if the liquor store next door, for example, starts selling recreationally. A huge misconception with regard to the passage of Proposition 64 is that it would mean the cessation of the medicinal route, but nothing could be farther from the truth. To the contrary, many medicinal dispensaries are remaining just that: medicinal, with no recreational access. Let’s look on the bright side, since Proposition 64 is in fact a reality as determined by California voters 56.75% to 43.25%. What might be the benefits the majority of California voters saw prior to casting their vote? It all seems to come down to the mighty dollar bill. So looking at the big picture, what does all of this mean for California’s fellow Left Coast states of Washington, Alaska, and Oregon who have already legalized it? Importantly, it means a strong alliance, influence, and statement to the rest of the country. Every state in the U.S. watched closely to see what decision California would make with regard to Proposition 64. California is perceived as a leader and trendsetter for the rest of the country. 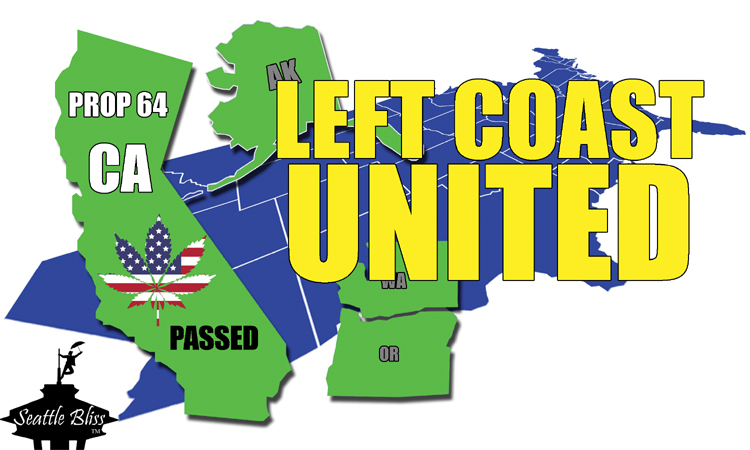 With the entire Left Coast now aligned and legalized, this is sure to set an example for other states, and we’ll likely see a green carpet rolling out as more and more states legalize it. During Prohibition cannabis had to go underground. For decades, it might have been found in the bedside table of every young college student, waiting to be visited at about 4:20 in celebration of a productive class-day. Or it might have been found rolled and ready, and stashed alongside legal smokes in an infantryman’s cigarette pack while on patrol in some foreign land. But it was most often actually found in the pockets of minorities during harassment searches. These harassment searches went on in front of everyone, but no one stepped forward to defend the victims’ privacy or protections against illegal search and seizure of property - until recent years and under states’ protections concerning Medical Marijuana (MMJ). Pain, anxiety, spasms, cancer, and numerous other maladies have been discovered to warrant research and acceptance in the knowledge that every lie told in relegating cannabis to Schedule I has been debunked. Young people who’d tried cannabis in their teens or college years knew they had experienced none of the adverse effects cited by authorities, and the positives were gaining in number. They started talking to each other and realized there were plenty of perfectly fine stoners around. It took someone noticing that most of the possession arrests involved minorities before we began to consider prohibition is mostly providing a way to incarcerate large numbers of minorities. Initiatives from the people instructed lawmakers to make the appropriate changes – and change is happening. Cannabis taxes fund education in Washington. Our tax-starved public education system was rescued by the millions of dollars cannabis consumers contribute each month through purchases in state-licensed retail stores. As our state’s constitution prohibits any tax on income, property taxes and other creative means have been implemented over the years, placing the heavy burden on the shoulders of property owners and creating an uncomfortable situation for all. As everyone pays rent in some form or other, this system reaches into our pockets at every level of income, is not optional, and falls most heavily on the poor. As the thirty-seven percent tax on cannabis is completely voluntary, it affects only those who choose to buy it – and Washingtonians are buying it. In 2016 the state is on trend to collect over $972 million, twice the taxes cannabis generated in 2015 when largely unregulated MMJ collectives were still providing for patients. Should the new Trump administration prove its stripes and go after cannabis, I fear it will awaken a sleeping giant. We’ll see a recreational industry, with strong associations now grown near in size and power to those in the pharmaceutical industry, motivated to lobby Congress, fund initiatives, and support battles in courtrooms. And these are backed up by our state’s educators and a host of new businesses serving the cannabis industry. Cannabis won’t be killed with legislation – at least, not at this point – and its momentum is building. There’s just too much money to be made, and enough powerful players are in it now. Some changes to think about in the nation’s future should include a ban on for-profit prisons and any form of prisoner labor programs, reschedule cannabis to Schedule 3 or remove it completely, regulate it like alcohol and tobacco, and allow home growing for everyone. I realize industry stake-holders fear losses if anyone can grow. But the truth is this plant is not as easy to grow as one may think. It can’t just be another plant in one’s garden. It needs a very controlled environment, nutrient and watering regimen – and most people don’t have the patience. Should home growing get the go-ahead from Olympia, I would expect a boom in the area of home gardening for a while. However, as most people lack a green thumb or are put off by high utility bills, I don’t expect the retail cannabis market to suffer. Alcohol doesn’t suffer from home-brewers. Cannabis won’t either. Harassment searches are those undeservedly resulting from a very minor infraction of law, real or suspected, by an individual or group in the presence of law enforcement officials. Littering, loitering and other charges can easily be escalated into a more prestigious (for the officer) bust if a search can be justified.